Boy Scout Troop 6 was chartered in November of 1920 with its first documented meeting on January 19, 1921. 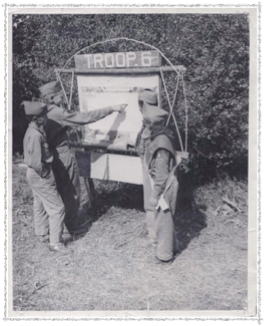 Before that, Troop 4 had been operating starting in 1913. The Teton Peaks Council was founded at a meeting held at Trinity on April 24, 1924. This was a favorite dessert of my hard working farm mother who was a long time Methodist in Shelley and Blackfoot. She never had a failure with this, and it dates back to the 1920’s. We girls hae all made it for our families and passed it on to them. Scald milk and allow to cool. Blend the butter and sugar then and beaten egg yolks. Add milk and flour and blend until smooth. Add lemon juice and grated rind and fold in stiffly beaten egg whites. Fold into an unbaked pie crust. Bake 30 to 40 minutes in a slow oven (320 degrees). The filling will be a firm custard with a top layer of cake. A creative leftover is worth its weight in gold! Use leftover macaroni and cheese, make into small balls. Crumb (whatever bread or cracker type you have), dip in egg (1 whole egg plus 1 tablespoon of water will coat about 12 medium size croquettes), crumb again. Let stand at least a half hour before frying. Fry in enough deep fat to cover. Grease should brown a bread cube in “forty counts.” After all, they had no fat thermometers… or at least didn’t need them! Do not crowd, frying three or four at a time so as not to cool the fat. It should take about 1 minute to brown them.